Supplied as a pre-assembled mixing valve and manifold assembly between 2 and 12 ways, incorporating the TM3 Control Group that uses an integrated thermostatic mixing valve with a remote actuator to give a temperature range of between 20oC and 70oC. The FMU2 includes a Lowara EcoCirc Class A pump, ErP 2015 compliant with variable and fixed speed control with antiblock technology. 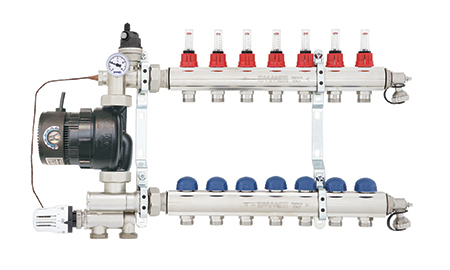 The FMU2 is a pre-assembled manifold and control group designed for underfloor heating systems. The combination of TM3 control group and manifold is factory tested to 10 bar and includes remote sensing thermostatic mixing valve, high efficiency circulating pump, temperature gauge, integral automatic air vent and non-return valve for easy system filling. The pre-assembled unit can be simply fixed to the mounting surface and connected to pipework and electrical components making installation extremely simple. Available in 2-12 ways with optional double regulating flowmeters or lockshield valves fitted to the flow bar. The return include electrothermic valves which are designed to be opened on demand by Control T electrothermic heads. The mixing valve assembly is designed to supply a set mixed temperature between 20oC and 70oC which will suit a wide range of applications. The low range has been designed to ensure that the screed drying process in carried out correctly. An electronic actuator can be fitted to the mixing valve to give electronic control of the system when used with the RCE weather compensator. The addition of the ErP 2015 Compliant Lowara Ecocirc circulating pump gives high efficiency operation with combined anti-block technology. 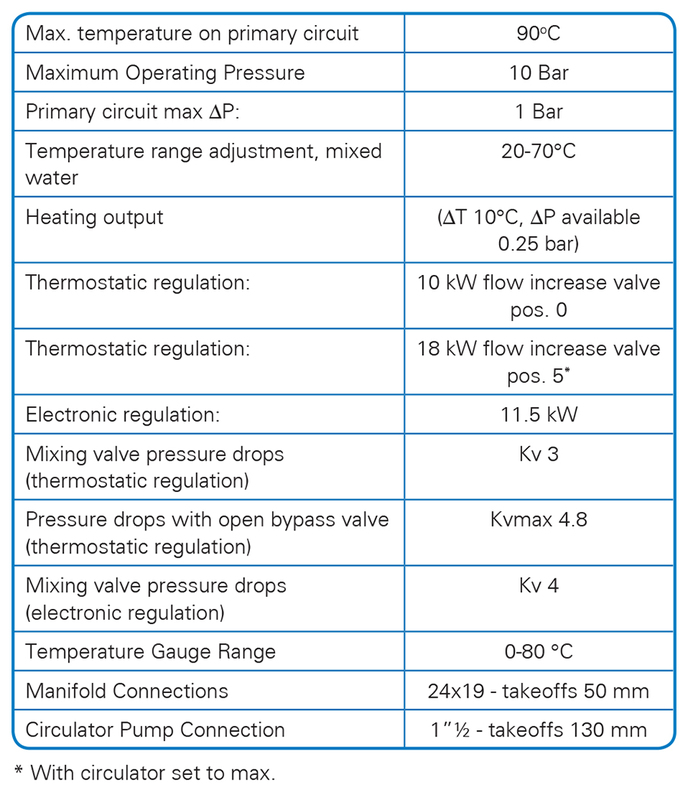 The pump can be set to variable or fixed speed to overcome high resistance systems or large installations. Designed for the UnderFloor Heating market, supplied as a pre-assembled mixing valve and manifold assembly between 2 and 12 ways. The control group incorporates a Lowara EcoCirc Class A pump and a thermostatic mixing valve with remote actuation giving accurate mixed temperatures between 20-70oC. Includes 1” M manifold connections with O-ring seals and 1”M connections for primary flow and return. The flow rail has a double regulating, 0 – 4 l/min flow meter per circuit. Return rail has a blue capped integrated electrothermic body (ready for the head) per circuit. The Lowara EcoCirc Class A pump is ErP 2015 compliant, variable and fixed speed with antiblock technology. Valves Kvs 3 – 4.8, 10kw – 18kw. 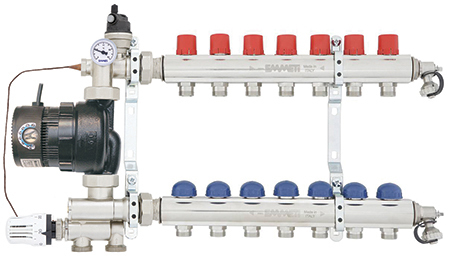 Designed for the Under Floor Heating market, supplied as a pre-assembled mixing valve and manifold assembly between 2 and 12 ways. The control group incorporates a Lowara EcoCirc Class A pump and a thermostatic mixing valve with remote actuation giving accurate mixed temperatures between 20-70oC. Includes 1” M manifold connections with O-ring seals and 1”M connections for primary flow and return. The flow bar has a double regulating lockshield per circuit. Return bar has a blue capped integrated electrothermic body (ready for the head) per circuit. What is the head rating of the Lowara Ecocirc pump installed on the TM3 / FMU-2? What are the TM3 pipe centres? What is the kW rating of the TM3? The TM3 with a Delta T of 10oC is rated to 14kW but can be increased to 18kW through the use of the flow regulator. What size are the flow and return primary connections on the TM3? Can an electronic actuator be fitted to the TM3?